As you paddle down the Kyle of Sutherland you will be struck by the utter peace and beauty of the surroundings. It is a place where the sky meets land and water in a grand sweeping gesture and where you may hear the call of Whooper swans and herons, or even spot deer, an otter or a sea eagle. The wider area is also a rich source of local produce, and it is food we enjoy in our home and enjoy sharing with friends and family. As well as experiencing the wonderful scenery, wildlife and peace of this beautiful part of Scotland, our delight is to welcome you to share in some of the bounty of local artisan and homemade food; a selection of the best of what the Highlands has to offer. As part of your canoe journey down the Kyle, along its wide expanse and through its meandering sheltered creeks, Ian will take you to one of the pretty wooded islands where you will enjoy a picnic lunch. The food is homemade, and locally and organically sourced wherever possible. All our family's bread is handmade from organically grown flour, from Shipton Mill in Gloucestershire and from Golspie Mill in Sutherland and we get lots of requests from friends to bring some along when we visit. It is about seven or more years ago since I started growing my sourdough starter and I have not looked back since. As well as homemade bread, we provide homemade oatcakes made with oats from Golspie Mill in Sutherland, soup, and home baking (for example, lemon drizzle cake, chocolate brownies, flapjacks or shortbread). The cheeses for the picnic lunch come from Highland Fine Cheeses in Tain, Rosshire, the smoked salmon comes from the family owned Luss smokehouse in Loch Lomond, the venison salami comes from the Great Glen Charcuterie in Roy Bridge, Lochaber and last but certainly not least, our venison chorizo comes from our very own Roaring Red Stag wild meat products based in Altass, near Lairg in Sutherland. The eggs to make our cakes come from the from the Cluckingham Palace hens at the Storehouse, Fowlis Ferry in Rosshire or Knockfarrel Produce near Dingwall, as do most of our vegetables when not from our garden. Knockfarrel Produce have also provided us with their organic gluten free sausages from their fine pigs for a barbecue we did for one our events. In season, and harvest permitting, we also provide salad from our organic garden and home grown or local soft fruits. We cater for most diets and we are only too pleased to accommodate you with gluten free, dairy free or sugar free options amongst others. Please just let us know and we will do whatever we can. We have previously made chickpea patties, beetroot hummus, coleslaw, soup, oatcakes, and gluten free brownies and cookies for our visitors with special dietary requirements. Until the early 20th century, every parish would have relied on its own water-powered mill. Now, only a handful are even partially operational in Scotland, often turned into tourist destinations to engage visitors with living history. Golspie Mill in Sutherland is one of the last fully operational, commercial watermills, grinding peasemeal, rye, bread and plain flour. Their medium ground oatmeal is the essential ingredient in our best ever oatcakes and we add their delicious, nutty wholemeal bread flour to our sourdough bread. When the Mill at Long Newnton, Tetbury, in Gloucestershire was discovered by the current owners in 1981 it was a derelict, though impressive, Cotswold stone building at the end of a rutted track. The machinery to clean the corn and drive the traditional French Burr Stone Millwheels has been lovingly restored and, where necessary, modern equipment has been sensitively included. There has been a mill there for over 900 years, as recorded in the Domesday book, and much of the milled grain would have come from the surrounding fields as it does today. To make our rosemary white sourdough bread, we use their delicious organic white bread flour which is made from a rare single variety of English wheat called Maris Widgeon, blended with organic wheat from the continent. Our wholemeal country grain bread is made from their 'nutty' Three Malts and Sunflower organic brown bread flour described (to my delight) as 'the colour of speckled hens', and it is just our favourite. We are delighted to now be able to supply venison chorizo produced by our very dear friends Marcus and Jennifer Munro and family who live in Burnside, Altass just above our beloved Kyle of Sutherland. They specialise in cured chorizo with all meat procured and produced locally in the Highlands. Venison used in their products is from wild, free roaming deer, humanely dispatched in coordination with regional deer management plans to help protect the environment and give their products the freshest and best quality meat available. All other meat products are sourced locally from the Glen and free grazed. With state of the art processing equipment on site, every aspect of the sourcing, preparation and production of their produce is done in house with only herbs and spices imported from outside of Scotland. The Highland Fine Cheese Company in Tain is a family business established in 1963 by the Stone family. They have been making cheese in the Highlands since 1951. They manufacture traditional cheeses unique to the Highlands and Islands of Scotland. Specialising in soft, creamy varieties, the range includes oatmeal and peppercorn covered Black Crowdie; Caboc, rolled in its trademark pinhead oatmeal; Strathdon Blue; Highland Crowdie and their very delicious Fearn Abbey Brie made from ewe's milk. Their hard cheese is called Tain Truckle, a cheddar which is rich and full of flavour. Knockfarrel Produce started life in 2010 when the owners, Jo Hunt, Lorna Walker and their two children, Finlay and Angus, up scaled from a walled garden in Cromarty to their 40 acre croft. They have several 30m polytunnels which provide a protected growing space for salad, baby leaves, herbs, tomatoes, cucumbers and peppers. Their outside field area grows, for example, root vegetables, cabbages and purple sprouting broccoli. They have a splendid insulated, larch clad chicken house for their flock of free range hens who lay lovely brown eggs with bright yellow yolks and which we use to make delicious cakes. We have just recently sourced the smoked salmon we provide for our lunches from the Luss Smokehouse in Loch Lomond. They are a family run business combining basic natural ingredients with time honoured curing techniques to produce the flavoursome, succulent beech smoked salmon they want their customers to savour and enjoy. All their products are smoked over Beech using sustainably sourced fish from the west coast of Scotland. Using only the finest and freshest fish from their network of trusted suppliers, each fish is individually hand filleted before gentle kiln smoking in the traditional way for up to 12 hours. Great Glen specialise in producing charcuterie using only wild Scottish venison. They are a family business set up ten years ago by Anja and her husband Jan Jacob. 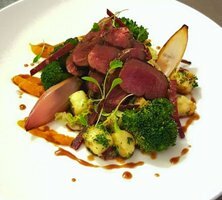 All of their products are produced by hand and air dried because Jan Jacob is passionate about preserving as much of the unique and unrivalled flavour of wild venison as he possibly can. We can testify that the finished product is mouth meltingly delicious. The Storehouse has an excellently stocked artisan farm and produce shop as well as a restaurant and gift shop. The shop stocks a wide range of locally produced vegetables and delicious eggs from their own hens which we use to make our cakes, and a wealth of artisan cheeses, meats, fish and preserves to name but a very few of their very extensive selection. Well worth a visit.